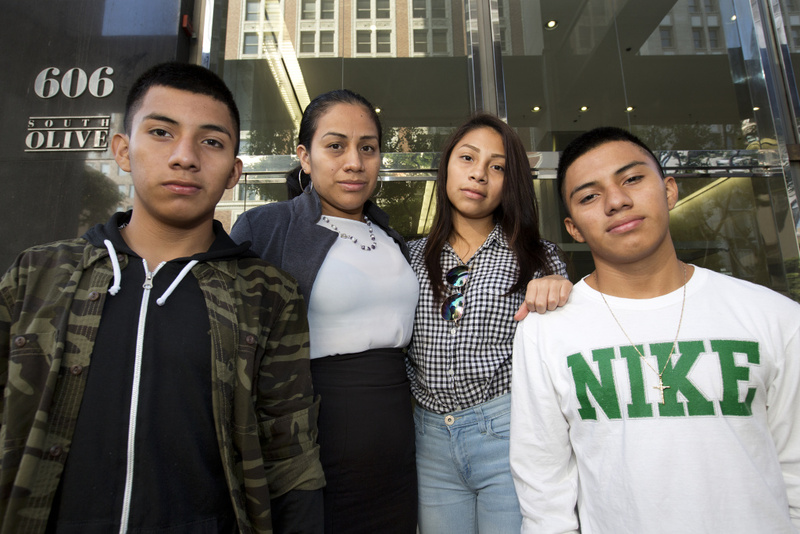 Left to right: Luis González (16), his mother Ana Hernández, sister Mariela Michell Beltrán-Hernandez (15) and brother Alejandro González (16), stand on the steps of L.A.’s immigration court in downtown just ahead of a court date for their younger sister on Friday August 12th, 2016. Mariela arrived in the U.S. in March 2016 to reunite with her older brothers and mother after years of separation. She now faces an immigration judge to fight her deportation from the U.S. She is seeking asylum to remain in the U.S. She said she fled gang violence in her home country of El Salvador. After dipping last year, the number of child migrants from Central America is once again surging. Nearly 60,000 unaccompanied minors were apprehended on the southwest border over the past 12 months – a 50 percent increase from the previous year, according to figures released in October by U.S. Customs and Border Protection. Many of the teens and children that first arrived in 2014 cited gang violence as reasons for their flight. This put them in an uncertain legal zone in their asylum claims, which typically respond to political or religious persecution. Despite measures by the Obama Administration to speed up their cases and urging from advocates and attorneys to clarify how gang violence should be seen under asylum law, thousands of juveniles are still working their way through the nation's busy immigration courts. 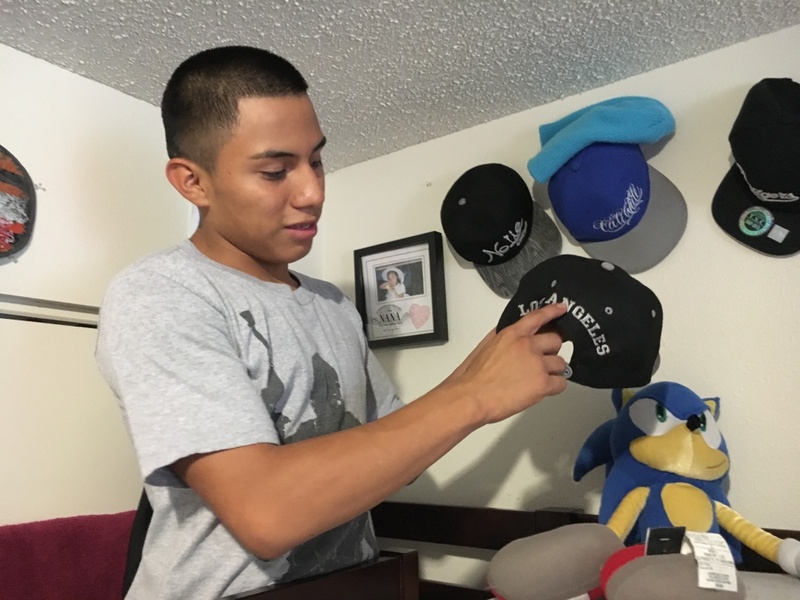 And for those that do receive the long sought-after asylum status, it can bring both hope and challenges to a new life in the U.S.
Luis Gonzalez, 16, shows off his baseball hat collection in his room. He was granted asylum, along with his brother, Alejandro, in 2016. "I was torn whether to continue or return"
Ana Hernández says the decision for her children to leave El Salvador was wrenching. She had left their home in the central part of the country when they were five, relocating to Los Angeles to seek steady work and send back money to them and their younger sister, who were being raised by their grandmother in her absence. As reports of violence and gang threats reached Southern California, she grew anxious about her children, who were entering their teen years. They could now become prime targets for recruitment from gangs, such as Mara Salvatrucha, or MS-13, a group with roots in Los Angeles and strong presence in El Salvador. Then two years ago, phone calls from one of her sons, Alejandro, grew more intense. "He kept saying, 'Mom, please bring me, bring me out of here,' asking me constantly," she recalled in Spanish. "But he didn't tell me what was really going on because he didn't want to worry me." Aware of the dangerous trip north from news reports and other families, she tried to dissuade her sons from leaving. She feared kidnapping or risky travel by bus or train across several borders. But during one call, Alejandro broke down. "He told me, 'If you don’t get me out of here, they’re going to kill me. If I stay here, they’re going to kill me,'" said Hernández. It was clear, she said, he was referring to local gangs in the neighborhood. "I didn’t doubt the fear, but the journey north also frightened me. I heard about all the risks, I watched the news. But I didn’t know what to do, because I also knew that they just couldn’t stay there." 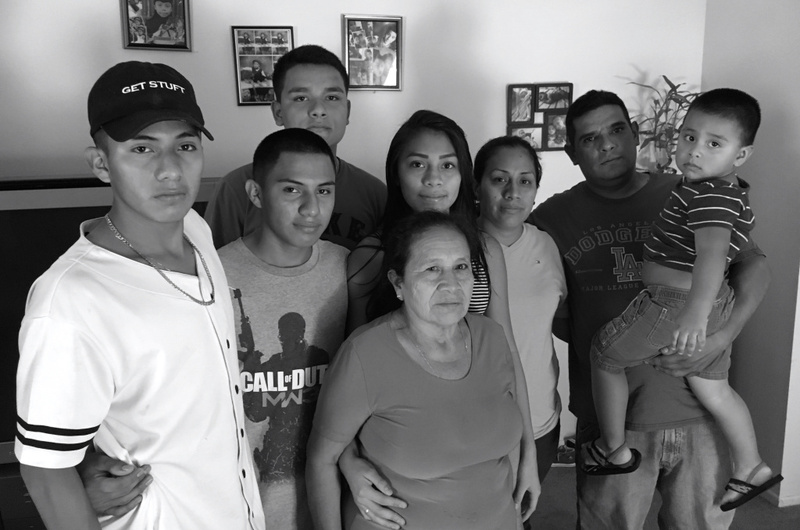 The extended Hernández-Gonzalez family in their home in La Quinta. The two boys, Alejandro, far left, and Luis, second from left, were both granted asylum in 2016 after fleeing violence in El Salvador. For Alejandro, then 14, who ended up leaving their home with his twin brother Luis, the journey north was also filled with conflict. "I was very afraid, not knowing if I should go forward or turn back. I thought a lot about my family – mostly about my grandmother who was still stuck back home," he said. "I was torn whether to continue or return." Eventually, the boys made it to southern Texas where they were apprehended by border officials. Their date of entry reads: June 24, 2014 in Hidalgo, Texas. That area is part of the border patrol's Rio Grande Sector, which charted 49,959 unaccompanied children that year – the highest by far of any sector along the Texas border. After a brief detention, Alejandro and Luis were reunited with their mother in Southern California and given a court date in Los Angeles. Their legal journey toward asylum had begun. El Salvador, Honduras and Guatemala top the list of countries that have sent child migrants across the U.S. border in recent years. According to the latest data from U.S. Customs and Border Protection, border agents apprehended 27,114 migrants from El Salvador traveling as families in the past year, making the country the highest source of family migrants. That's due to increasing instability and violence in the country, said Yanci Montes, the attorney who represented Luis and Alejandro Hernández-Gonzalez in L.A.'s immigration courts. Montes works at El Rescate, in Los Angeles, a legal advocacy group that offers low-cost immigration legal services. It was established in 1981 during the civil war in El Salvador, but the last few years have marked an influx that the group hasn't seen since that period, said Montes. 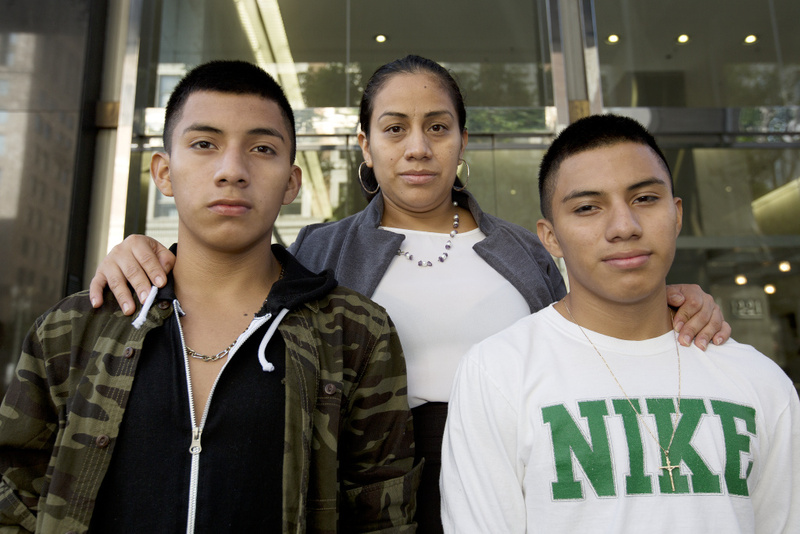 Ana Hernández with her sons Luis González, 16 and Alejandro González, 16 (white shirt) stand on the steps of L.A.’s immigration court in downtown just ahead of a court date for their younger sister Mariela Michell on Friday, August 12th, 2016. "I thought maybe people here wouldn't like us migrants," said Alejandro Hernández-Gonzalez. "But I've found the opposite." After two years of immigration court dates and asylum office interviews, the two boys were granted asylum in March 2016. Alejandro said he's focused now on playing soccer and making friends at his new high school. "People are offering a hand, helping from all over," he said. "And now I have to change my life for the better – it can't be like it was before in El Salvador." During a visit to the family's home in La Quinta, his brother Luis showed off his recent geometry homework. It's a class he's struggling with, he said, but determined to improve in. He also pointed out a baseball hat collection in his bedroom, which featured an L.A. Dodgers hat, and a line of skateboards leaning against the wall. "Here is my new country, my new life," said Luis, in halting English. "Everything is different." Correction: This story has been revised to correct the name of the organization that Yanci Montes, the attorney, works for. It is called El Rescate, founded in 1981. KPCC regrets the error. Who's behind the high Latino turnout in Nevada?